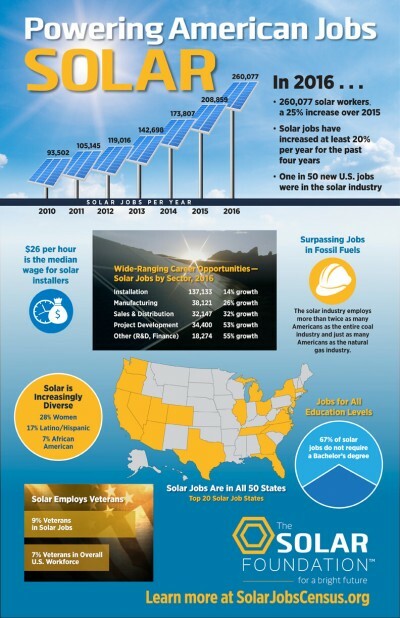 The American solar workforce grew at a historic pace in 2016, a year when one out of every fifty new U.S. jobs was in the solar industry, according to the new National Solar Jobs Census 2016, the seventh annual report on solar employment issued by The Solar Foundation. “More and more business leaders and investors recognize that climate changes present both risks and opportunities, but they need better information to make informed decisions. The Solar Jobs Census helps provide that,” said Michael R. Bloomberg, founder of Bloomberg L.P., philanthropist, and three-term Mayor of New York City. Since 2010, The Solar Foundation’s National Solar Jobs Census has defined solar workers as those who spend at least 50 percent of their time on solar-related work. The Solar Foundation has consistently found that approximately 90 percent of these workers spend 100 percent of their time on solar-related work. This year’s Census was part of the U.S. Department of Energy’s U.S. Energy and Employment Report (USEER) data collection effort that included more than 500,000 telephone calls and over 60,000 emails to energy establishments in the U.S. between October and November 2016. This resulted in a total of 3,888 full completions for establishments involved in solar activity in the U.S. The complete National Solar Jobs Census 2016 can be found at SolarJobsCensus.org.